What is Microsoft Azure Active Directory? Microsoft Azure Active Directory is a user identity management software with intelligent access policies that help you secure your organization’s resources. You can purchase it as a stand-alone application, but it is also an integral component of Office 365, Azure and Enterprise Mobility + Security. With Microsoft Azure Active Directory, you can centralize access governance to pertinent organization data, applications, and infrastructure while maintaining stringent security for the enhanced productivity of your workforce across the board. 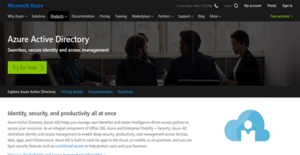 Moreover, Microsoft Azure Active Directory connects with cloud-based solutions as well as with mobile and on-premises settings. As such, you can apply its enterprise-grade security features such as conditional access rights to your business regardless of your environment preferences. Multi-location and global organizations require an identity management software that streamlines access to their provisioned resources. Microsoft Azure Active Directory offers you that platform where you can oversee the access rights of thousands of employees. The solution lets you create single authorization credentials to enable every member of your workforce to launch and access their cloud applications regardless of the operating system they prefer. Microsoft Azure Active Directory provides you with a secure setting so you can confidently work together with your business partners and customers. Though they exist outside of your organization, you can afford them access to pertinent data without exposing sensitive and confidential materials. And if you prefer, you can customize the interface to reflect your organization’s branding. Your IT team can see its workload reduced by the dynamic and automated workflows, such as the management of the user identity lifecycle, included in Microsoft Azure Active Directory. The solution also helps empower end-users by enabling them to change and reset passwords by themselves to minimize help center tickets. As such, your entire IT team can devote most of their time towards critical projects. Immediate action is imperative when it comes to unauthorized access to your organization’s resources. That is something the people behind Microsoft Azure Active Directory understand, which is why the application aids you in monitoring accounts. In case a suspected outsider intrusion is detected, the solution immediately alerts your digital security team for them to apply remediation actions. If you are considering Microsoft Azure Active Directory it could also be beneficial to examine other subcategories of Best Identity Management Software collected in our database of SaaS software reviews. It is essential to keep in mind that virtually no service in the Identity Management Software category will be a perfect solution that can meet all the needs of all company types, sizes and industries. It may be a good idea to read a few Microsoft Azure Active Directory reviews first as specific solutions can perform well only in a very small group of applications or be created with a really specific type of industry in mind. Others may work with a goal of being easy and intuitive and consequently lack complex features welcomed by more experienced users. You can also come across solutions that cater to a broad group of users and offer a powerful feature base, but that frequently comes at a more significant price of such a service. Make sure you're aware of your requirements so that you purchase a solution that has specifically the features you search for. How Much Does Microsoft Azure Active Directory Cost? We realize that when you make a decision to buy Identity Management Software it’s important not only to see how experts evaluate it in their reviews, but also to find out if the real people and companies that buy it are actually satisfied with the product. That’s why we’ve created our behavior-based Customer Satisfaction Algorithm™ that gathers customer reviews, comments and Microsoft Azure Active Directory reviews across a wide range of social media sites. The data is then presented in an easy to digest form showing how many people had positive and negative experience with Microsoft Azure Active Directory. With that information at hand you should be equipped to make an informed buying decision that you won’t regret. What are Microsoft Azure Active Directory pricing details? What integrations are available for Microsoft Azure Active Directory? If you need more information about Microsoft Azure Active Directory or you simply have a question let us know what you need and we’ll forward your request directly to the vendor.